Human headhunting is a tradition which was presumed to have died out ages ago, but this dark legacy lives on for this Indian tribe. The Konyak Naga Tribe in India used to display the heads of their enemies on the walls in their homes and wear jewellery to represent those who they killed. Although this disturbing trait is now a thing of the past, the tribe’s chilling history is still very much present. Tribe member, Luhbong Wang spoke to photographer Trupal Pandya who visited the tribe to photograph the remnants of their gruesome past. In earlier times we used to hang the heads of our enemies on the walls of our houses, but now we are not allowed. So we have replaced them with the skulls of animals that we kill to provide for our family. Heads were to us what money is to your generation. They brought us respect and meant getting a better girl for marriage. And our tattoos symbolised our achievements. 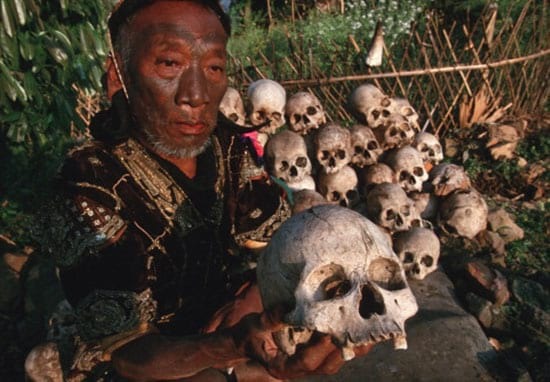 Killing people used to be a rite of passage for the tribe in the Longwa village, Nagaland, but now they only collect the skulls and bones of dead animals. Trupal bravely stayed with the tribe for a week, in the hope of encapsulating the way the ancient people still live. 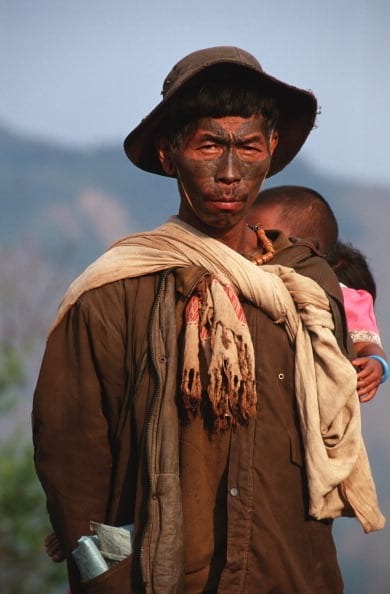 Ching Kum, the 86-year-old former headhunter, collected the tribe’s last human head in 1990 – an unsettling thought – while they were fighting the Chang tribe. For a very long time they lived a very secluded life because Konyak was a self-sufficient community making their own food, cloths and weapons. It has very basic facilities. If you need something specific, one needs to drive down the hill for two hours to reach a town called Mon. These days, killing people and savouring their heads is a part of the tribe’s haunting, but fascinating history, and life is very different for the once notorious fighters. The best is the past life. These days you say you don’t have any headhunting but you kill thousands of people a day. We killed four to five people a month for our rights. Now you kill thousands and still consider headhunting was bad. The tribe member does make an interesting point about the fact thousands of people are killed these days as people fight for their rights, as opposed to the few lives they used to take, although it definitely doesn’t make it right. It’s great the tribe’s way of life was captured before modernisation takes over completely and these stories are lost to the ages.